This book is about choosing a mindset of abundance and possibility and then making that real with specific practices. 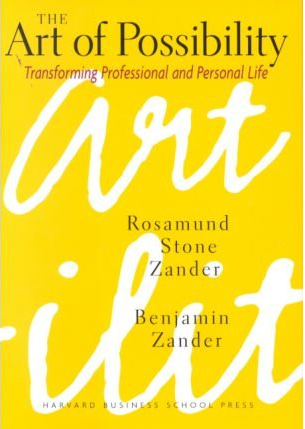 Examples are given from the music world where Benjamin Zander is a conductor and teacher, and from the world of business where Rosamund Zander is a leadership coach. In Taiwan I was Number 68 out of 70 student. I come to Boston and Mr. Zander say I am an A. Very confusing. I walk about, three weeks, very confused. I am Number 68 but Mr Zander says I am an A student…I am Number 68 but Mr Zander says I am an A student… One day I discover much happier A than Number 68. So I decide I am A. What the student had discovered was that frameworks of measurement are all invented. With that in mind you might as well choose a framework that gives you energy for greater creativity. If as a leader you begin with the assumption that your team have an A you will interpret any poor performance differently, you will begin by asking yourself “did I convey what was needed well enough?” then asking the person what they need to perform at the right level. That has to be a more productive conversation than assuming the fault lies with your team member. It opens up a world of possibility. The other practices involve lightening up, listening to your inner central voice, being a contribution and perhaps most importantly “being the board”. Being the board is really about taking on the responsibility for changing your own way of framing a problem. This allows you to “turn all your attention to what you want to see happen, with none paid to what you need to win, or fight, or fix”. The book is 20% practical steps, 40% wisdom, 30% vision, with a dose of 10% humour to keep you reading. There are some very honest and touching stories in the book that will resonate with even cynical readers. I learnt from it and have gone back to it several times for another dose of inspiration from time to time.